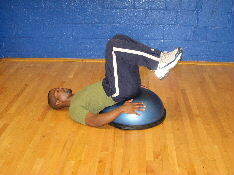 Lower Ab Crunches on a Bosu Ball are a pilates inspired lower stomach exercise. In pilates, there are many different tools that you can use to strengthen your abdominal muscles. Some of my favorite tools are the various shaped barrels. One of the barrels used in pilates is a firm semi-circle, that has a similar contour to the Bosu Ball. 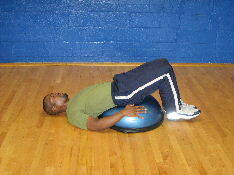 There are 3 major benefits to doing reverse crunches on a Bosu Ball. #1 When doing abdominal exercises on a contoured surface your spine can move segmentally, so you can focus on each vertebrae. #2 When exercising on a contoured surface, you get increased range of motion through the spine and hips which increases the challenge on your muscles. #3 With the Bosu Ball you also get an additional emphasis on coordination since the Bosu Ball surface is slightly unstable. 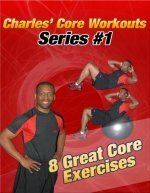 Bosu Ball reverse crunches are a really good ab exercise; however, I recommend mastering the basics first, so if you're completely new to exercising try starting with reverse crunches on the floor. Starting Position: Begin by lying on the Bosu Ball with your hips directly on the top of the ball and your back on the floor. Keep your feet together and your knees bent. You can use a mat for added comfort. Form: Inhale and slowly lower your heels towards the floor. Lightly touch your heels to the floor, and hold for a brief second. Then, exhale and slowly lift your knees back to the starting position. Repeat 10-15 times. Personal Trainer Tips: It is important to maintain a neutral position of the spine. Use your abdominal muscles to keep your spine solid. Only your hips should move not your lower back. If you have trouble controlling your lower back, simply don't lower your legs as far to the ground. The Bosu Ball is a great piece of ab exercise equipment, and it is an awesome tool for strengthening the abdominal muscles. If you see one in the gym, try doing a few lower ab crunches in your next ab workout.